Haunted mansions, sneaky mind-controlled children, demons and crazy professors, the Tales from Lovecraft Middle School series has it all. In the second book, The Slither Sisters, there are appearing more gates into another dimension where monsters lurk, and it’s up to Robert and his friends to save the town. When reading the first book in the series, Professor Gargoyle, I was entertained but not very thrilled. In The Slither Sisters the action picks up immediately, making it a much more satisfying read than its predecessor. It has a lot of adventure, jumping through gates, the heroes finding themselves in sticky situations. I liked that in The Slither Sisters the bad guys got a bit more background. I prefer my villains to be just a bit more of a dark grey than a stark black. It was nice to see the crazy professor from the view of someone very close to him (can you tell I’m trying very hard not to spoiler anything?). There are some new characters introduced in this part, but it actually helped the story along instead of bogging it down. 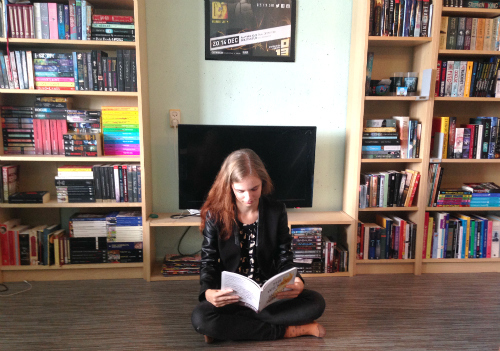 The characters don’t really grow throughout the book – but they might throughout the series. There was some romantic development that I thought was very sweet and age appropriate. I very much enjoyed The Slither Sisters, and I think these books would be perfect for both boys and girls that don’t mind a bit of spookiness in their books. This second novel in the Tales from Lovecraft Middle School series begins right where Professor Gargoyle ended. Seventh-grader Robert Arthur has discovered that two of his classmates are actually sinister snake-women in disguise. Even worse, his new middle school is full of “gates” to a terrifying alternate dimension – a haunted mansion full of strange spirits and monstrous beasts. For Robert to protect his teachers and classmates, he’ll need to return to this haunted dimension with his best friends Glenn and Karina. Can they uncover the secrets of Lovecraft Middle School before it’s too late? The Slither Sisters features more bizarre beasts, more strange mysteries, and more adventure. It’s perfect for readers ages 10 and up. 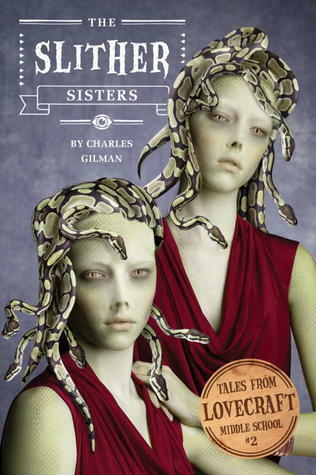 Best of all, the cover features a state-of-the-art “morphing” photo portrait – so you can personally witness the sisters transforming into their slithering alter egos. You won’t believe your eyes!